Playable at: no statement - Promenade. Requires: affiliation, Bartender, Dabo Girl, Waiter, any Quark, any Rom, Ferengi ship. 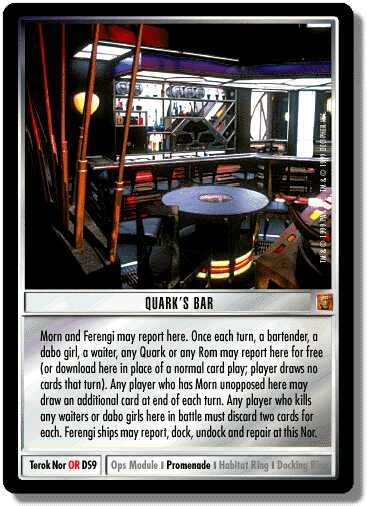 There are 43 entries for Quark's Bar (ST1E 8 R 128) at the Tradeplace (53 haves and 12 wants). Click here to see all trade list entries for this Rare card!